A4 120g USA T-max inkjet hollow light-colored transfer paper (v1.0) 10sheets/pack use with household iron or hot press machine. This paper is designed for thermal transfer (sublimation ink) ink transfer cotton material design. Not suitable for ordinary ink and pigment ink. After 11 years. A dream come true. To share with you today! After a comprehensive solution to transfer ugly “glial bottom” problem: with just a hollow transfer paper transfer step easily.
. Only the color of the transfer, the other part of the show “hollow out” effect, farewell with scissors and cutting plotter. Instead of the traditional screen printing process, no plate. One piece printing , easy to complete, with an excellence effect. Suitable for 100% cotton or containing high amounts of cotton clothing and fabrics. A4 120g USA T-max inkjet Dark fiber thermal transfer paper (v3.0) 10sheets/pack use with household iron or hot press machine. Completely new Inkjet USA TMAX Dark fiber thermal transfer paper Suitable for transfer: polyester, polyester-cotton, cotton, chemical fiber, uniforms, sweater, sportswear, jackets and other dark fabrics. ▲ particularly suitable for the transfer smooth surface with a water-resistant synthetic fabrics coating. ▲ for a variety of carving cutting plotter, complex patterns can be positioned overlying film transfer. ▲ impermeable bottom, strong adhesion, high solid, . ▲ bright colors, high color reproduction. Photo finish pure pearl white with sparkling and brilliant effect. Suitable for use with water base dye and pigment ink, used for all inkjet printer Support up to 2880-4880 dpi. Special surface coating able to resist the penetration of water, exposed to even big amounts of water cannot completely wash off of a print surface. ColourInkjet Transparency Films are constructed of a high grade clear film that produces vivid colors. 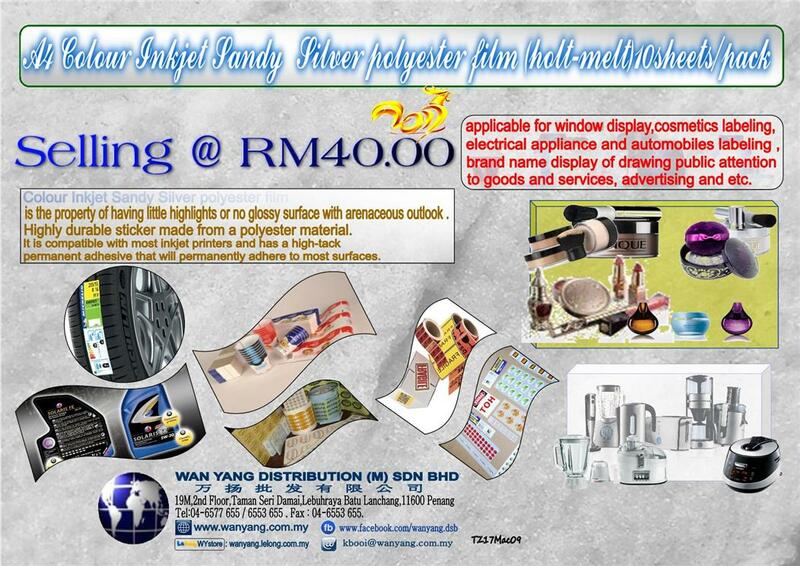 Inkjet Transparency Film is designed to print high-quality transparencies from your inkjet printer. 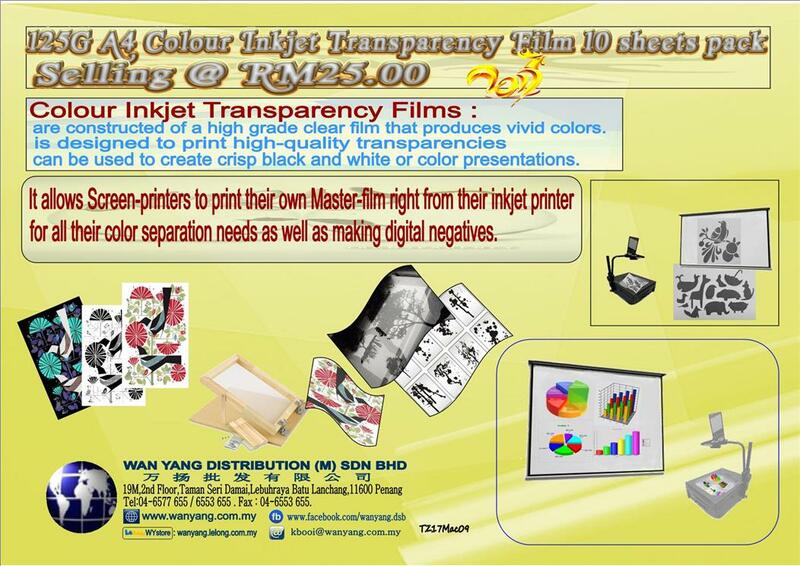 This transparency film can be used to create crisp black and white or color presentations. for all their color separation needs as well as making digital negatives. 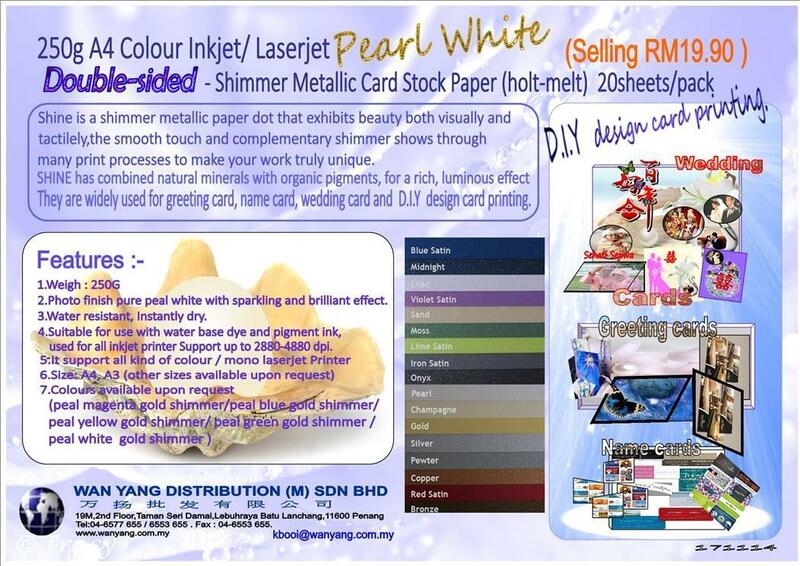 They are widely used for greeting card, name card, wedding card and D.I.Y design card printing. Photo finish pure peal white with sparkling and brilliant effect. Suitable for use with water base dye and pigment ink,used for all inkjet printer Support up to 2880-4880 dpi. 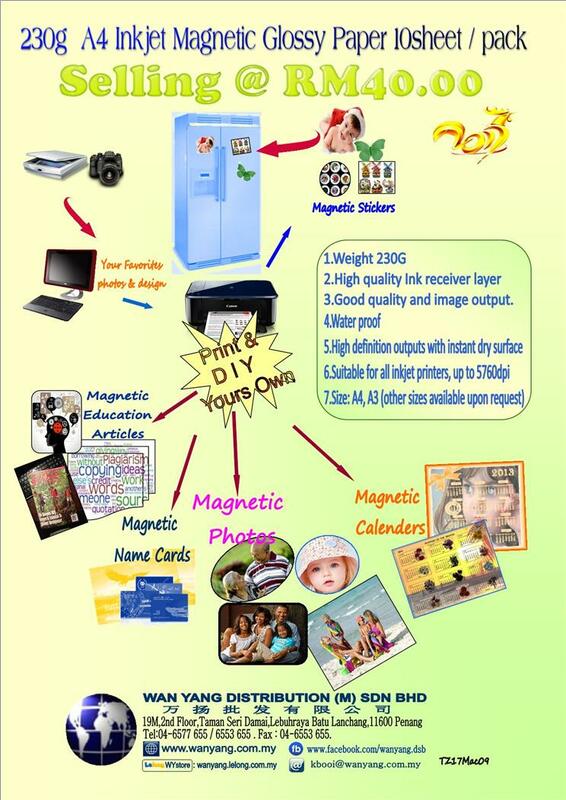 They are widely used for industry packing print-out, self-adhesive photo print, D.I.Y design sticker print. 3. Super white, High glossy surface, Smooth coated, Vivid photo quality with max color saturation, true. 4. Water resistant, Instantly dry. 5. Suitable for use with water base dye and pigment ink, used for all inkjet printer Support up to 2880-4880 dpi. Create your own decals silver colour with metal effect using your inkjet printer and our specially formulated inkjet waterslide paper works superbly on mugs and plates creating that ideal personalized gift. Laminate the transparent film with silver decal paper. These waterproof transparent adhesive gloss polyester labels are supplied on A4 sheets and are for use on LASER/Inkjet printers . They have a permanent adhesive. When applied to a solid surface they are almost completely clear, but will look slightly frosted if applied to glass. Transparent labels are often used to add text to packaging (this sidesteps colour matching) , or because they look decorative on bottles and containers. 3. Good quality and image output. Why choose white PVC sticker because it is able to print white colour image on dark colour object. Pressed against the glass, you can see both sides pattern, without glue component, torn down without any residual seal.it can be repositioned anywhere that you want. Method of use: print on Sandy Gold polyester sticker then tear off ( transparent ) static film and paste on it afterward stick onto the object that you wanted. Create your own design and print on our Sandy silver polyester sticker, The color of sandy gold patterns is bright and shinning has strong saturation. Method of use: print on Sandy Silver polyester sticker then tear off ( transparent ) static film and paste on it afterward stick onto the object that you wanted. · Size: , A3 (other sizes available upon request). The color of printed patterns is bright and has strong saturation; at days it absorbs natural light and lamplight, while at nights it release rays of light which makes the light-colored part of the printed pictures take on a luminous effect. The effect lasts long with full personality. It is not only can be used in decoration, public places (such as hotel, corridor, building, warehouse etc. ), but also applicable for transportation use ( bicycle, motorcycle, car and lorry ) helmets , toys, switch, handle, telephone and electrical equipments etc. Good quality lucent output and luminous effect. 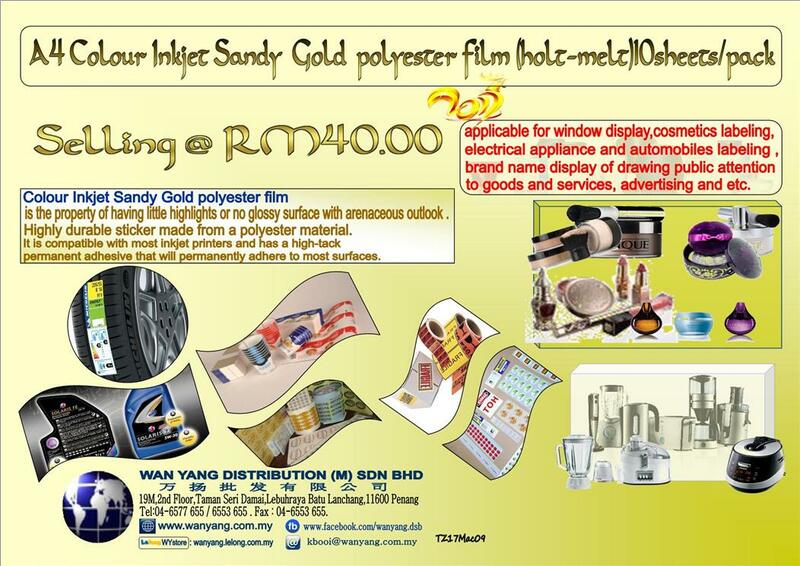 Colour Inkjet Sandy Gold polyester film is the property of having little highlights or no glossy surface with arenaceous outlook . Highly durable sticker made from a polyester material. It is compatible with most inkjet printers and has a high-tack permanent adhesive that will permanently adhere to most surfaces. Which is applicable for window display, cosmetics labeling , electrical appliance and automobiles labeling , brand name display of drawing public attention to goods and services, advertising and etc. Bright color and clear picture. Colour Inkjet Sandy Silver polyester film is the property of having little highlights or no glossy surface with arenaceous outlook . Highly durable sticker made from a polyester material. It is compatible with most inkjet printers and has a high-tack permanent adhesive that will permanently adhere to most surfaces. Colour Inkjet Matte Silver is a highly durable label stock made from a polyester material. It is compatible with most inkjet printers and has a high-tack permanent adhesive that will permanently adhere to most surfaces. It is designed for many industrial applications such as certification labeling such as CE, FCC, ROHS, PSE, ERP, C-TICK, SAA,CSA,UL,CCC,CQC,SASO,UN38.3,ISO9001,CEC,E-MARK , electronics labeling, garment & bag as well as many other surfaces. 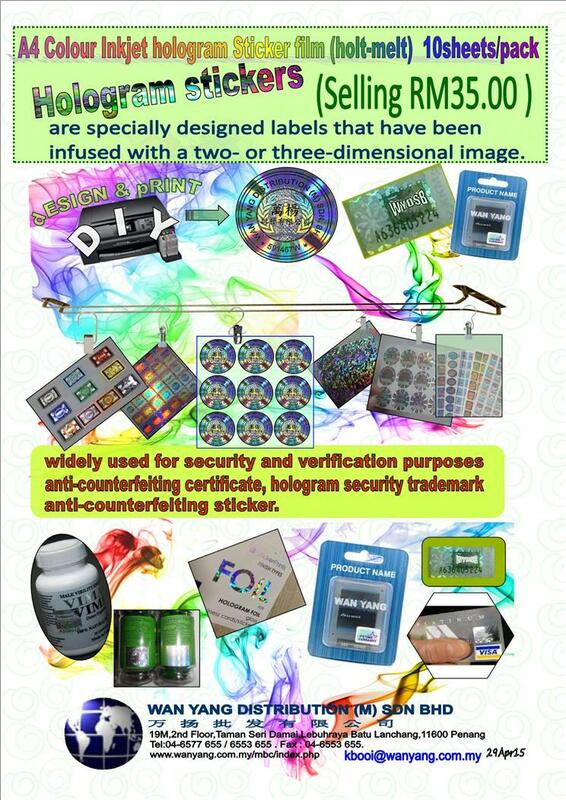 Hologram stickers are specially designed labels that have been infused with a two- or three-dimensional image. They are widely used for security and verification purposes, anti-counterfeiting certificate, hologram security trademark as well as anti-counterfeiting sticker. Many businesses use holographic stickers to protect theirs brand name and product property the intent is to provide an extra layer of security. Customer can purchase the 3D plastic card from us to enhance the layer of security. use with all kinds of inkjet/LASER printers. 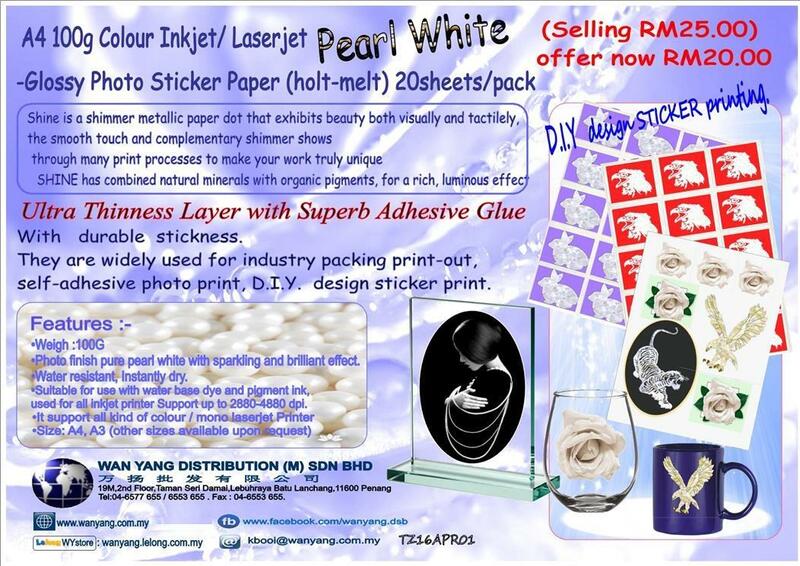 Colour Inkjet glossy photo metallic sticker film, they are widely used for industry high grade packaging. Specially use for window display , indoor portraying, photo salon, reproduction of antique, Cosmetics, Electrical appliances brand name display. 2. Super High glossy surface,Smooth coated,Vivid photo quality with max color saturation,true. Inkjet Fluorescent Paper Sticker paper, they are widely used for price tag ,note printing, gift wrapping , D.I.Y decoration design sticker print. · Suitable for use with water base dye and pigment ink,used for all inkjet printer Support up to 2880-4880 dpi. Inkjet double sided High Glossy Photo paper, they are widely used for high resolution post card print-out , wedding card print-out , name card print-out and menu print-out . 4) Suitable for color inkjet printers, colour laser printer. Laserjet double sided High Glossy Photo paper, they are widely used for high resolution post card print-out , wedding card print-out , name card print-out and menu print-out . 4) Suitable for colour/mono laser printer. 7. Size: A4, A3 (other sizes available upon request). This Tattoo Paper is specially designed to create your own personal temporary removable skin tattoos. This removable tattoo paper can be used easily with an ink jet. Skin tattoos / Temporary tattoos / Removable tattoos can now be made with your own custom design, artwork, or logo in a very short time. This removable tattoo paper for inkjet/LASER tattoos is easy & fun to use and the creative possibilities are endless! 1. Good quality and image output. These waterproof transparent adhesive gloss polyester labels are supplied on A4 sheets and are for use on Inkjet printers . They have a permanent adhesive. When applied to a solid surface they are almost completely clear, but will look slightly frosted if applied to glass.